The law on workplace pensions has changed with the recent onset of auto enrolment. There are hundreds of thousands of smaller companies across the UK approaching their staging date, and between now and April 2017 millions of workers will be automatically enrolled into a workplace pension. 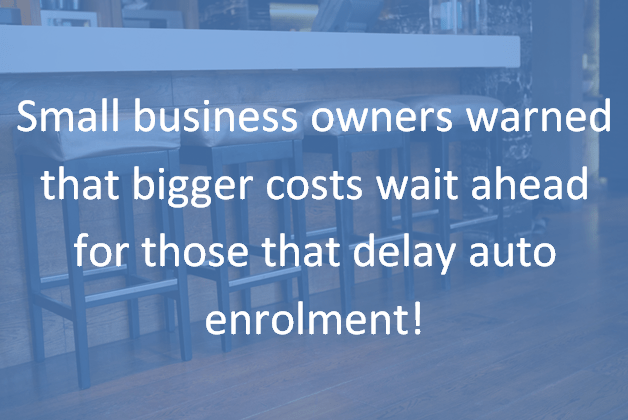 Auto enrolment is the law and you must act now. As an employer, you’re responsible for enrolling all eligible employees into your scheme (and contributing to it), providing they meet certain criteria. We would advise you start talking to your pension adviser as soon as possible, preferably with more than nine months to your staging date (ideally twelve), to build a timescale and agenda to make sure it all falls in to place. Those that wait may face bigger costs. A key point to note here is that pension solutions are not necessarily free and some of the large insurance companies will charge employers a service fee to have their pension scheme. The ability of pension providers to provide solutions is becoming a real issue of capacity and if you delay your auto enrolment preparations you will likely be charged a more expensive service fee. The difference in fees can be quite high. Watch out for big fines too. The Pension Regulator is clamping down on businesses who fail to comply so any delay is risky. Regardless of their size, firms can be fined £400, with the possibility of further escalating fines. Free auto enrolment seminars – be fine, not fined! For more information and free registration please click here. The law on workplace pensions has changed, but there are still many cloudy areas surrounding the regulation, particularly eligible employees and employer duties. We would therefore like to invite you to one of our seminars on preparing for auto enrolment, by Erica Dietsch, Independent Financial Adviser at Hawsons Wealth Management Limited. If you have any questions regarding auto enrolment, including those mentioned above, then please come to one of our free seminars in September and October – Sheffield (29 September) – Doncaster (1 October) – Northampton (8 October). The seminars will provide an overview of auto enrolment and employer duties, covering who the new law applies to and what you need to do as an employer. You will also have the opportunity to ask our Hawsons Wealth Management Limited experts any additional questions.